This is a guest post from Amanda Kaiser, the presenter of our free webinar “What You Need to Know to Attract & Engage Young Members,” which was part of Wild Apricot’s Membership Growth Online Summit 2017. Click here to get access to watch Amanda's webinar. I’ve come across many organizations who try endlessly to engage younger members, but to no avail. From my experience, it’s because they’re breaking one key rule without knowing it. But there is good news. Once they start following that rule, they’re able to engage younger members with ease. Each of these suggestions reflects a desire to meet half-way with the other person. This is a natural desire. Within each of us is a hyper sensitive awareness of fairness. Meeting family, friends, and co-workers halfway is fair. Contributing more than half is generous. The halfway rule extends to our relationships with brands as well as with monetary transactions. For example, if I give a store $4, the store lets me leave with $4 worth of pomegranate pips (yum!). While we apply The Halfway Rule effortlessly to many areas of our lives, we often neglect it when it comes to membership management — especially with younger members. 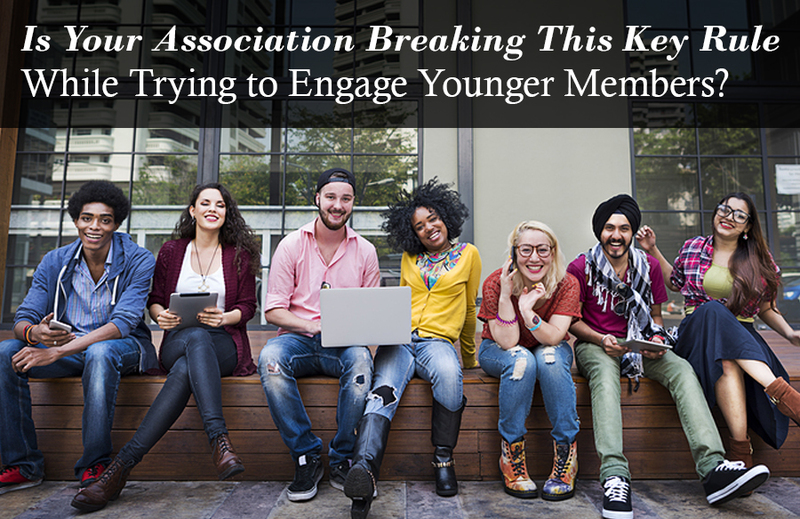 Many associations do not honor The Halfway Rule in the eyes of our new and younger members. Why? Well, we often require them to come more than halfway. Consider this new member’s journey. A young professional plunks down her membership dues. She has just come halfway. Now, the association should provide her with an equal amount of value. Instead, the member gets an email with her username and password to the website. She knows she should familiarize herself with the contents of the site, but who has time? Emails start pouring in. The few she opens are nearly indecipherable because the words and language are clearly for those who have been in the profession longer, and not for her. Soon she starts ignoring most of the association’s emails. Perhaps after a few months or weeks, she realizes there is an event in her area. So, she decides to give it one last try, and she plunks down more money. She has just come halfway, again. The day comes, and our new member drives to the event. Just by getting there she has come halfway yet again. She arrives, collects her stuff, launches from the car, finds her way around the venue, and finally approaches the registration table. Without a welcome, much warmth, or even a quick conversation, her badge is located. The member then finds her way to the meeting room. She notices that everyone is deep in conversation or laughing, except her. She feels awkward as she scans the room trying to find an empty seat. Let’s stop our story here. At this point, our new member has tried to meet the association halfway three times. So far, she has not received any value or had a feel-good, meaningful experience. The scale is tipped far in favor of the new member who has been doing all the giving. By now she is starting to wonder if she made a mistake. With a sinking feeling, she ponders whether being a member will be worth her time and money after all. It is difficult for an association to make a comeback once a new member starts feeling this way. We never want our members feeling like they made a mistake in joining. In fact, we want them to feel great about joining! The key is to proactively manage their first experiences immediately after they become a member. Some associations send a special new member email that guides the younger member to a low-friction, high-value offering. Some associations call new members, asking them about themselves so they can recommend a benefit that fits each new member’s exact need. Events are a very good time to welcome and orient new members. Start adding value days before the event by educating younger members about advanced topics they will hear about and help them prepare by letting them know what to expect the day of the event; things like, what to wear and what to bring. During qualitative research, new members say that one of the most influential parts of their first event experience is how welcome they feel. Often our younger members feel awkward. We can head this off by designing ways to warmly welcome them, help them feel at ease, and get them primed for the day ahead. Don’t leave them hanging! Engage and retain many of your younger members by meeting them halfway. If you want to learn how some of the most successful organizations are rapidly building a younger membership base, please see my free webinar on “What You Need to Know to Attract & Engage Young Members,” which was part of Wild Apricot’s Membership Growth Online Summit 2017. Amanda Kaiser is a qualitative researcher for the association industry. To date, she conducted over 345 in-depth member interviews. Through these conversations, she has come to understand members’ goals, challenges, and worries then translates these insights into strategies that exponentially improve member engagement. Channeling our member’s voice, Amanda also writes a weekly blog for association professionals at SmoothThePath.net. Amanda helps you engage your new members early to engage them for life!